Reports say that Anderson entered the fray as a second half substitute, replacing Sam Garza in the 71st minute, and put his name on the score sheet in the 79th minute. Anderson, according to reports, performed three step overs against his marker, before his deflected shot beat Oklahomaâs goalkeeper Ray Clark. It was Sounders 2âs go ahead goal, after both teams were level at 1-1. The Sounders scored again in the 80th minute through Rave Craven, who completed his brace, as his team ran away, 3-1 winners. The victory put the Soundersâ record to five wins, two losses and one drawn match. Sounders head up the Western Conference. The Sounders 2 will be in action on May 22 against Portland Timbers 2 at the University of Portlandâs Merlo Field. 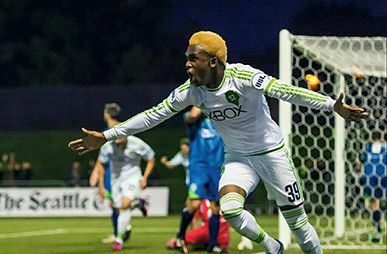 Anderson, a resident of Barrouallie, who plays for local club System 3, was loaned to Grenades in Antigua for a six-month period, before inking a professional contract with the Sounders 2, set up last month.